and identify opportunities for the Parks Board to expand them. 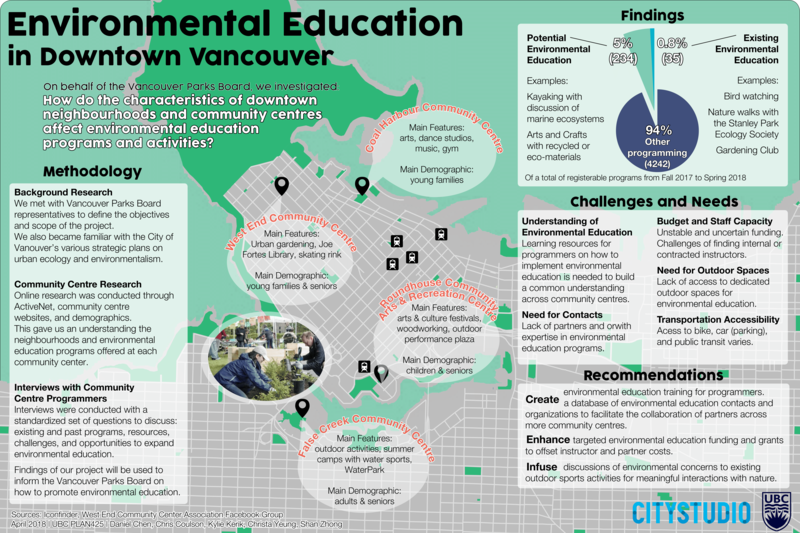 In order to produce a comprehensive scan of environmental education programming challenges and opportunities, a total of 23 community centres across Vancouver were surveyed between 5 groups in our class. Our group focused on 4 downtown community centres: Coal Harbour, West End, Roundhouse, and False Creek. Through online research and in-person interviews with community centre programmers, we wrote a group report, executive summary, and presented a poster of our findings. Parks Board with facilitators of programs at community centres to cultivate support for environmental education. Further surveys and analysis of local practitioners of environmental education will be conducted in the future to develop strategies for implementation. Tadah! The cover page of our group report! Examples: community gardening programs, cedar basket weaving, removing invasive plants. As I have been involved in environmental education as a volunteer at the Vancouver Aquarium for the past 2 years, this project was an exciting opportunity to combine my own experiences as someone involved in implementing educational programs to broader understandings of the behind the scenes research and city policy that drives these initiatives forward. One exciting aspect of this project has been learning about and forming connections to the City of Vancouver's strategic plans such as the Environmental Education Stewardship Plan and Biodiversity Strategy which both promote the enhancement of and access to Vancouver’s natural areas. In general, we found that there were very few environmental education programs currently available at the 4 community centres. Most programs are indoors and range from arts and craft to natural beauty product making and horticulture. Fewer activities occur outdoor, and when they do they are mostly out-trips or walks around the neighbourhood that happen in the Spring and Summer. This was mostly due to issues of lack of partners with expertise in environmental education, funding, and access to parks and natural areas. One major opportunity we identified through the interviews with the programmers to easily expand environmental education across the four community centres was through integration to pre-existing programs. This was defined as "potential programs" in the findings pie chart of the poster and included for example: a meaningful discussion of marine ecosystems and ocean pollution in kayaking lessons or the importance of native bird species in a bird house making woodwork class. Create environmental education training for programmers, that is designed to cater to demographic needs so that programmers can learn how to include environmental education specific to their neighbourhood. that can act as potential partners in running these programs. education by increasing targeted funding to offset costs for instructors and partners. Coordinating interviews with community centre programmers amidst busy schedules. Transcribing and interpreting data collected from the online program registration system and interviews to formulate a concise set of findings. On a personal note, it was my first time designing a poster with this much information and while it was quite challenging, I enjoyed exercising my artsy side of cartography :)! 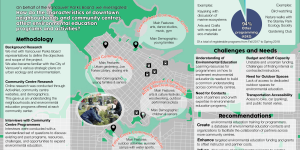 Designed and presented a poster to summarize the project scope, methodology, and findings of environmental education in Downtown Vancouver using Adobe InDesign. 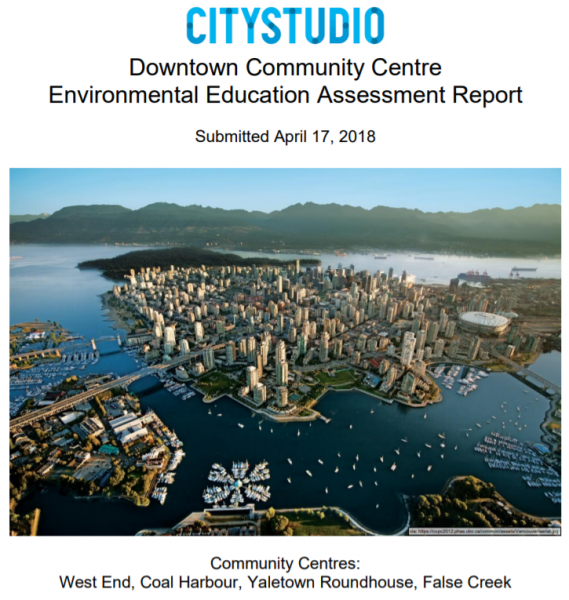 Wrote a comprehensive report with 4 classmates to summarize the findings, challenges, and opportunities of implementing environmental education at 4 Vancouver community centres. Conducted interviews with Community Centre Programmers to collect primary data on available programs, community interest, and challenges of implementing environmental education.